During my first afternoon at Orphans of the Storm®, I scouted out the other long-timers that I wanted to visit with so I would know exactly where to go next time. One dog that caught my attention was Lex, a seven-year-old Rottweiler mix, because he was very sweet when I stopped by his kennel. So, when I returned to the shelter this time, I asked to take Lex out. His face is extremely attentive (and also extremely cute), and his ears perk up when he hears a potentially interesting sound, which causes his forehead to wrinkle in an adorable way. When I started to give his back legs a good scratch, he leaned in towards me so I could continue. He sat (briefly) when I asked him to, but I can’t blame him for getting up so quickly since there were so many new smells for him to explore. Lex has been at the shelter since 2006, far too long for such a good dog. Stop by the shelter and get to know him yourself! Next on my list was Emerald, another dog who has been at Orphans of the Storm® since 2006. Emerald arrived with a litter of puppies, all of whom were adopted very quickly, but poor Emerald was left behind. 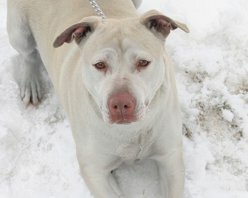 She is an enthusiastic eight-year-old Labrador/Staffordshire Bull Terrier mix who loves to run and jump like a puppy. Like Lex, she led us straight to the run and was thrilled to be out. I let her roam around the run for a few minutes before calling her over. When I did, she came barreling towards me with a big doggy grin and gently jumped up to give me a hug. She allowed me to place her back on the ground very easily, and I squatted down to her level. That still wasn’t close enough for her, because she attempted to climb into my lap before realizing she was too big. She then decided to place her front paws on my arms so we were eye-to-eye. I learned that this is how she prefers to receive her belly rubs: standing up on her back legs while resting her front paws on you, so you can then reach down and rub her belly. Emerald would explore the run for a few minutes, run back to me with a wagging tail for another belly rub, and repeat. She also enjoys being scratched under her chin (which does, at times, have some doggy drool on it). Although she doesn’t come across as dog who likes to give kisses, she does love to be face-to-face. In Emerald’s opinion, the closer the better. Emerald deserves a loving home, just like all of her puppies. Will it be with you? 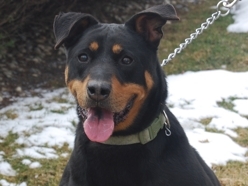 Posted by Meet the Pooches on October 19, 2011 in Dog Profiles and tagged adoption, American Staffordshire Terrier, animal shelter, Chicago, dogs, Labrador Retriever, Orphans of the Storm, pets, Rottweiler.